In honor of National Occupational Therapy month, DSC has chosen to feature Amy, a long time consumer who participates in many DSC services. 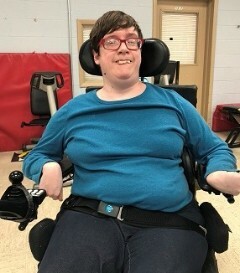 Amy works closely with her OT team to help her with stretching, personal care, transferring in and out of her wheelchair, making accommodations to access all areas safely, and allowing her to go on community outings that are meaningful and fun. Amy stated that Cindy has helped her achieve goals that were previously out of her reach. On her last outing she enjoyed a delicious smoothie at Smoothie King. Amy is a member of Parkland Pops and the Prompting Theater. She practices two days a week for Parkland Pops to prepare for shows that occur twice a year.